Sorry for the slight blogging delay (I started having withdrawals on day two, I’ve missed you guys) but I was at a blogger conference over the weekend. Ironically enough, I wasn’t able to blog during the blogging conference. It seems so wrong, right? But I digress. Of course I had no idea what to wear so I turned to my trusty mustard pants. And not to make my favorite red orange pumps jealous, but I might have picked up some new pink shoes. Pink is the new red orange. Right, Pantone? I love the pink shoes with the mustard pants! I just bought some yellow pants. I think you made me do it. That’s what I told my husband, anyway! Can’t wait to wear them! The speech was awesome! TxSC was so fun, wasn’t it! I love the purple shoes and pink lips! So cute!! I love that picture of you at the podium! Holding court! And love this mint on mint action. 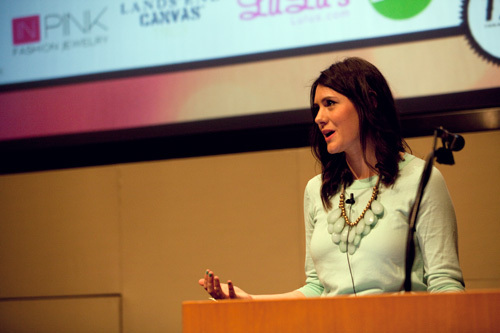 What blogging conference were you at? I wish atlanta had these, but they don’t! So hard to connect and network with other bloggers here. Umm, is there a video of this speech. I think I need to see it. Love the mustard pants! Wonderful necklace and shoes!! You are a gorgeous lady! I loved your speech, Kendi! It was great meeting you and Bryan at the parties – I’m so glad you made it down to Austin! You look great! Love the new shoes! cute outfit and congrats on the speaking engagement! this is such a cute outfit! sweet pumps! love that necklace! The conference must have been so great; I wish I could have gone! You looks absolutely lovely and the colour palette is gorgeous. Ultimate blogger goal: Actually get to go to a fun conference/meetup someday. I love this color combination on you! Those heels are pretty great! love the mint with the mustard! you have an amazing way with color … love this outfit! You sure know how to pull together a color combo! Love, love, love! Especially the shoes! You look fabulous and stylish! What a lovely outfit, in such an unexpected color combination! Love how you can colorblock so easily (can colorblock be used as a verb?). And the necklace is gorgeous. Oh how I love the colours in this look! So beautiful! Ooh I love the mix of mint and yellow. So perfect! Love the outfit…especially the shoes! I love your color combo here! Mustard and minty blue look divine! You are a beautiful speaker! And I do love those mustard pants with your new pink shoes! Wow look at you, profesh. I have those shoes in blue and aren’t they surprisingly comfy? I adore them! Wish I could have been there! You look fabulous Kendi. this look just inspired me to go get my own pair of mustard pants! so pretty! That mint colour looks great on you. I love the combo of mint and yellow! I’m sure your speech went very well! And you look lovely as always! I love the combo of mint and mustard. Very cool color combination and even more eye-catching with your pink/fuchsia pumps! p.s.love your j. Crew pants. Which one is it? I love how the necklace matches perfectly with the top, but adds some amazing texture. Your speaking looks wonderful to me! I’m glad people wanted to listen to you! Love love love these mustard pants. You look like a natural speaking up there! The colors in this outfit are GREAT together! I’m sure you wowed them at the conference 🙂 Wish I could have been there. 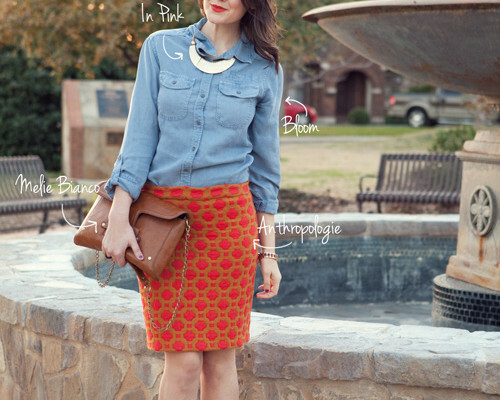 love this entire outfit and I can totally see why the pink shoes are your new fave! Love how you incorporate so many different colors yet still make it work. SO compelling, Kendi 😉 Are those slingbacks? I’m super jealous, hard to find style of shoe. And I love that you’re wearing pastel/bright versions of the primary colours. i love the outfit!!! so pretty!! The colors in this outfit are great!! I would never think to put these colors together but they look fabulous on you! Love the cute mix of colors. The necklace adds an amazing amount of texture to the outfit! Your sense and talent for colorblocking is simply marvelous. I may or may not be obsessed with it. whoa. did you get an oscar for this performance? because you are SELLING it, woman. i am convinced that you are serious about blogging. compelling, indeed. Beautiful colors paired today! You look like you were rocking the speech! Wish I could have been there to see you speak! I’m going to for sure make it out there for the conference and sxsw next year! I loved your speech yesterday as the keynote speaker! It really spoke to me as a blogger to be confident in my voice and stay true to myself and follow my dreams no matter the challenge. Unfortunatley I was unable to speak and meet you at the conference but I did speak with your husband on Saturday at the speed mentoring session. After hearing your speech yesterday, I loved that you both were on the same page and both gave out amazing advice and motivating inspiration! Kendi, I totally loved your speech yesterday. You were fabulous! Love the mint colour and love the pretty shoes!! Gorgeous! I love the necklace/sweater combo! This is such a fabulous outfit!! The shoes are fantastic! you make style color look so easy. i love those pants on you my dear. You are a color genius. I absolutely love this and the shoes are absolutely the perfect touch! Lovely outfit! I love the purple/mustard/pale blue combo. That is literally my dream necklace – love it! Such a great color. Was it the conference in Austin! I am so bummed I missed it! I am from San Antonio and when I found out about it, it was already to late. I would have loved to hear your info. I love your oufit, you really have a good eye for mix and matching colors. Very compelling. Perhaps you should think about a career in motivational speech, cause that face and body language say it all. I mean, look at those hands. Compelling. I dig the color block combo. Nicely done, Kendi. You look great, love all the colors! such a perfect outfit – totally love it!! I love this outfit…and I’ll be picturing that necklace in my jewelry box dreams. You were so wonderful. Thank you for your words. I keep thinking, “my bog is not my identity…it is my blog. it is just a blog.” It was a joy to meet you in person too. And you were compelling! How great is it that all 95% of us last year said so? I love the mustard + pink. This might be my favorite outfit of yours. It’s so great. I love the color-blocking. I’m sure you did a wonderful job speaking! Wish I could’ve been there. And you gave a fabulous speech Kendi. I really enjoyed hearing what you had to say! My favorite line (yes, I was writing notes on my phone): “the danger comes when you look around and see everyone else’s best and think it’s their always.” TRUTH. Brilliant observation — I’m quoting this! Wish I could have heard the content of your speech — I love your wit and I’m sure in your speech you displayed it in spades. Care to share with us what you talked about, pretty please? Probably my favorite outfit I’ve seen you in! You always put together such great colors. Wish I could have heard your speech! That outfit is amazing. You always look stylish Kendi! ha! I love it. The outfit is great too! I am in love with this color palette!!! I've wanted a mint sweater for awhile and yours would be perfect. Haha, compelling indeed. Glad you’re back Kendi! What a stunning outfit! Lovely and unique color combination. That’s a really interesting colour combo! Love those shoes! Great color! LOVE the teal and mustard together alot alot alot. I follow you on reader so I never get to comment but I have to say you’re one of my favorite fashion blogs not only for your cute outfits but for your writing! I love your sense of humor! Gorgeous! would have never thought of pairing these colors together! 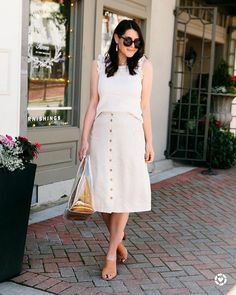 you look lovely- great outfit choice and perfect for spring! I adore the combination of colors!!! So beautiful and spring-like!! (: Very pretty!! Really like the colors you put together, so fresh and pretty! Wow I am really in love with this necklace! You are just so adorable. And really awesome at mixing and matching colors. Go you. wwo, takes guts to give a speech! Good for you! Hope your speech was well received! Truly inspiring. My fav was “Comparison is the theif of joy.” I think that should be all bloggers’ motto. I ended up with your skirt from the swap and can’t wait to wear it. Take care! Perfect as always! I too am obsessed with mustard pants! The shoes are amazing! Compelling indeed. You look beautiful. Love the blocks of colours. I love the whole outfit. I am absolutely in awe of you finding a necklace and a sweater in the same color. Wish I could have been there for your compelling speech! Are you going to be there next year too? I love your use of colour in this outfit and your shoes are especially gorgeous. Spring is near and I cant wait! Looooooove your mint colored blouse. Your shoes are probably the single most expensive piece of clothing you wear every day, and are undoubtedly the garment you put under the most stress and expect the most out of. Take care of them and you can get some extra mileage out of your clothing budget. Great you!!!!!! 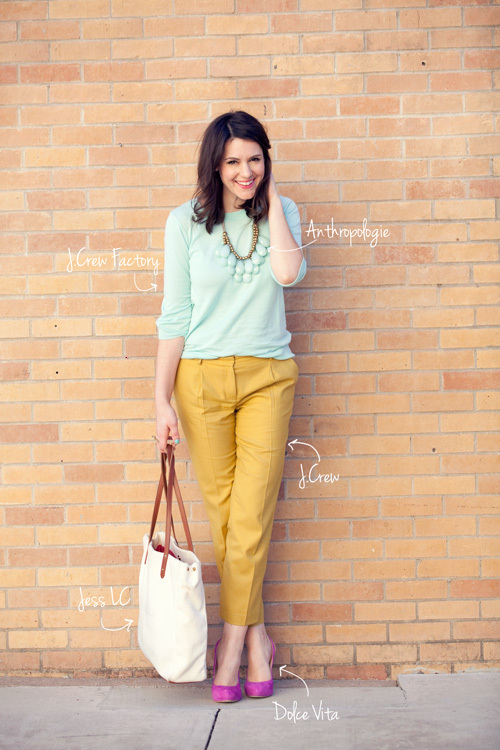 Love the outfit: lovely Mint, sweet mustard, great pink!!!! and the necklace? a classic Kendi accessory!!!! You look good even when you sleep…I am sure!! Love the yellow with those shoes. Love the way you put this colors together. Also, super cool the way the necklace matches the sweater…love! Of course your outfit was amazing…but your speech was so inspiring…even for those of us who have been out there for awhile. I will share parts of it with my audience but also with my high school students! You are living a dream and a great example of how others can do the same!! Keep up the great work! You are precious! Your outfit is very beautiful and chic! I love the colours here… They make me happy! I just adore those colours together. And I especially love that frosty mint colour! love the whole thing! You are so great at pairing colours. I really think mustard is a great neutral, but I never would have thought to pair it with that mint green color. Great thinking, though; it looks great! You look awesome. I love that mint pastel! So my trend this spring. Yay for those awesome shoes too!! Beautiful! I especially love the pants but can’t really do yellow (its tragic)…I would love them in green or blue!! Love this necklace! I think you totally look like you should be giving a speech! Simple and chic 🙂 I love it! Is there a video of your speech?! I love the color combo, so bright and appropriate for spring! BTW, I’m glad you’ve found multiple ways to wear your mustard pants, I TOLD you there were a million ways! Come take a look at The Austonian Tour! beauty!!! I love the tonal combo of mint top+mint necklace. and I adore dolce vita, and therefore, those gorgeous shoes. You look great! You kind of remind me of drew barrymore in the bottom photo.. .super duper cute! Looks like that was an fun event! Some other blogs I read went that! I love love this outfit. What a great combination of colors! Colorblocking has been one of my favorite trends these past couple of seasons. I have so much of it in my closet. It would be great if you could stop by my blog and see a current photo of Style Underdog. Thanks so much! I would’ve never thought to wear a necklace with the same color top, but it looks lovely! You did a great job speaking! I loved your keynote speech. I am totally and completely iiin loooove with this outfit.. i mean…and the necklace just kills mee… love uu! You look like the reincarnation of Spring/Easter/Robin’s Eggs/ and Cadbury Eggs. It’s truly perfect for the start of the month that comes in like a lion and out like a lamb. congratulations on your speech..and I love your outfit! Love the pink shoes, all of it! You look so very pretty…there’s a bloggers convention???? I don’t know much about the world out there!!!! So nice to meet you! And your sweet husband, too. I hope ya’ll had a safe trip home. Your outfit looks so beautiful! All those colors togegher are so great! This is such a great combination. I can usually put two contrasting colours together but the pink shoes completely make this outfit. You are so good at mixing colours Kendi! Bah! No I know what you mean, I do that with bloggers I read. I’m afraid that my voice is pretty disappointing — a normal voice with a Texas accent that I can’t kick. The colors all look so good together!! absolutely love your outfit! spring perfection! ha ha you look so sad/passionate about something….blogging I am assuming…or clothes. LOVE those pumps….yes your orange/reds should be jealous! Those colors are so gorgeous together! You look so stylish! Your speech was inspiring — thank you so much. I did a sketch of you, check your email! Love that necklace and that shirt! Such a great color! You did fabulous darling…I especially loved the “shot game” you introduced to us during your speech. Although I was already doing it before you said something…but I play the shot game at all times. You are fab and I didn’t get to hug you and the hubby goodbye…so hug him for me! See you in blogland! Kendi, I love the outfit!. The stormy seas necklace is one of my favorite anthro pieces ever! 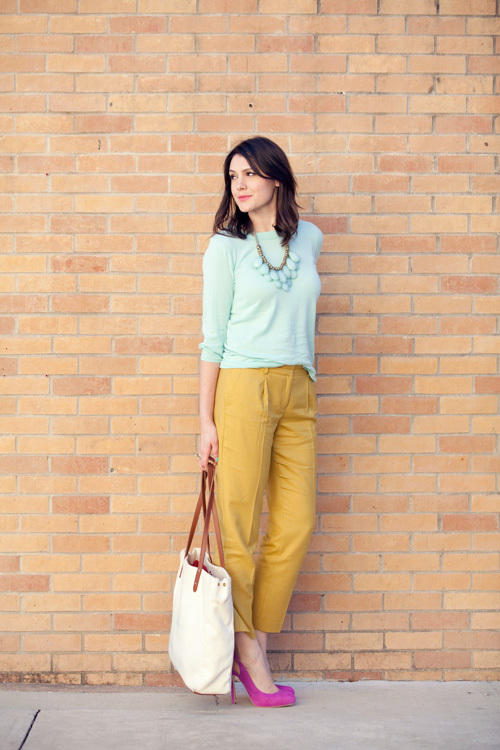 The mint top and mustard pants go really well with it. Can yoy please share where I can find them or similar styles?Thanks! The colors in this outfit are so beautiful! i would never think to mix these colors – but they fit together like magic! Love the mix of colors in this look! Your necklace is great!! I’m very crazy for shoes, buying new stylish and unique shoes is my hobby. You look stunning. I LOVE all the bright colors together. I’m sure that was a great conference to attend. Jealous! i wish you posted more about the conference and the experience you had being the keynote speaker – i mean, that’s a pretty big deal. i feel like i’ve learned more about you from some recaps a couple other bloggers gave and what they shared about you and your speech, so i’m a little disappointed you didn’t share more about that on your own blog. but either way, you looked fantastic, i love the mint green top & necklace! Heidi — just because I haven’t posted anything doesn’t mean I won’t. It took a lot of time and effort to write and give the speech I did and I just don’t want to throw a post together. The subject that I spoke on means a lot to me and I want to give it the weight that it deserves. Going from the shop to a three-day conference and back to the shop doesn’t give a whole lot of time to write a great post, but hopefully in the next few weeks I can cover my experience! great, i look forward to reading it and learning more about you and your blog and the subject of your speech! i apologize if any way my comment came across as being demanding, it was not intended that way at all (darn internet that does not convey tone!). i have been following your blog for some time now and would just love to get to know you better and hear more of your thoughts about the things you have the opportunity to experience! Simply adorable. The shoes are way cool!! Aha, love the last photo…”if you ever wondered…” hehe. How did the conference go? I love the colours in your outfit, I feel like I would not think to put these colours together. They go so well, I need to be more creative. Love it! I’m really living the mustard colored pants! I wish I could have seen you speak.. I bet you had great things to say! I am very interested in the tote bag you have in these pics. Where did you get it?